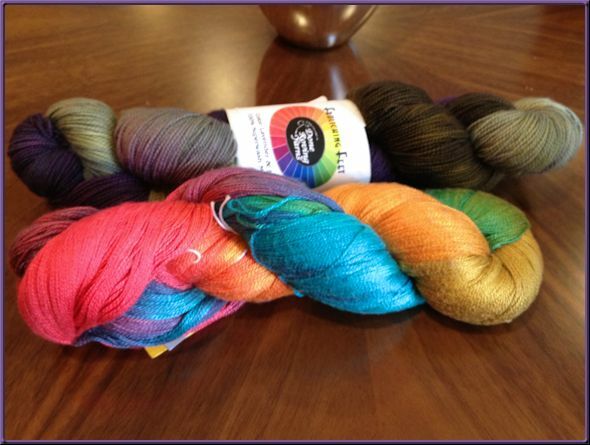 Yesterday I hosted the knit group and we had a blocking party for my longstanding Color Affection shawl. 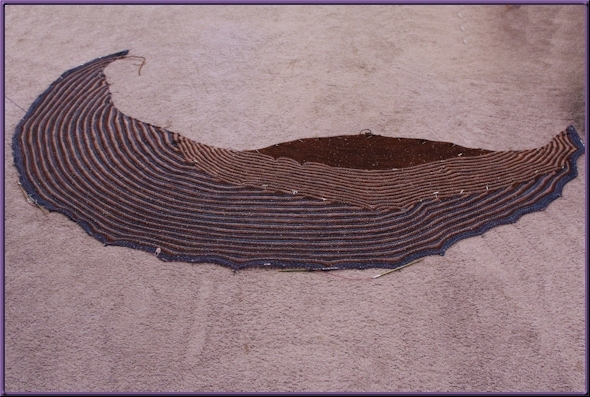 It’s done, it’s blocked, and ready to be given to its intended recipient. 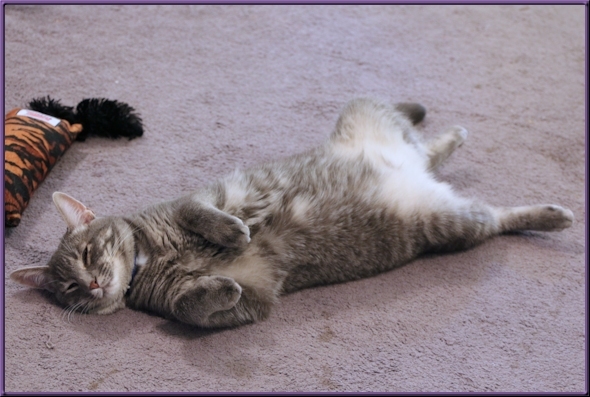 I get to do that tomorrow, which will make for a nice Monday. 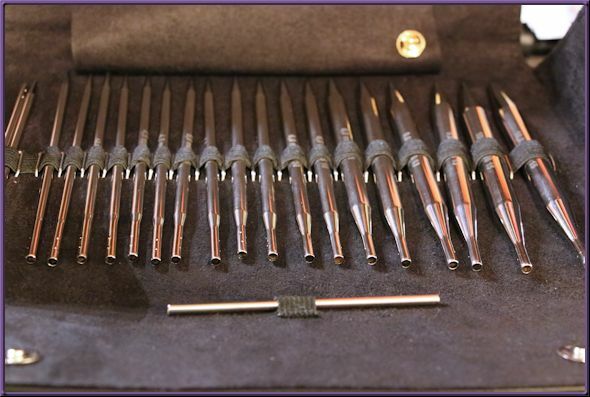 I read a lot of the comments about modifications people have done to this pattern before proceeding. 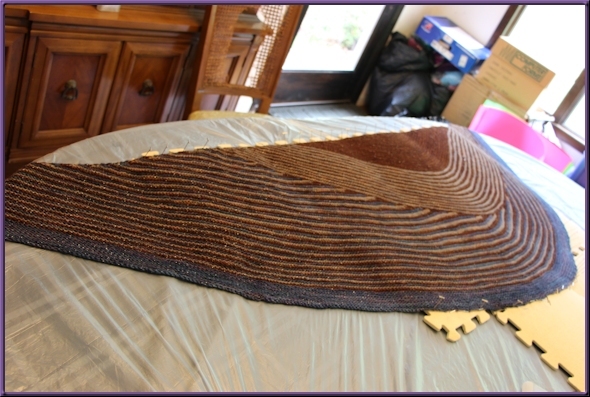 In the end I chose to do a KFB increase instead of M1L and M1R, as this is garter stitch and KFB is very unobtrusive in that case.I was also concerned about the overall finished depth of the shawl from top to bottom, because the recipient is tall. Sp I added an extra repeat in the short row section. Next time I think I would add depth in the two-color section instead. I have to say that even though it took me forever, I really enjoyed this project. 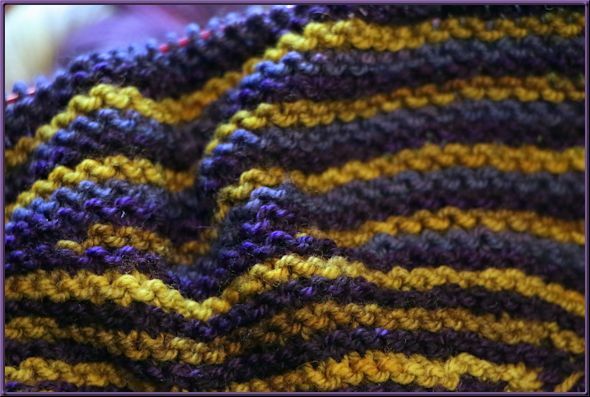 It was simple because it was garter stitch, but it held my interest because of the frequent color changes. 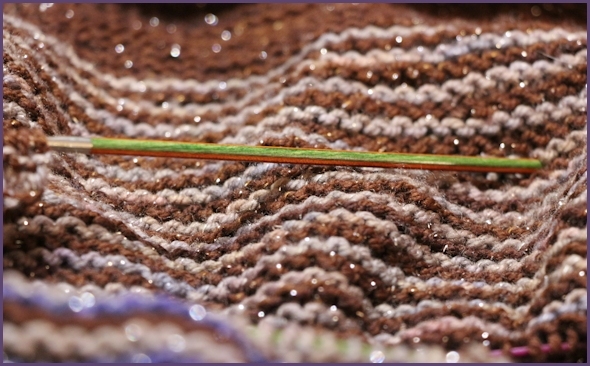 That, and because of the (really simple) short rows, every time I showed it to someone while it was in progress, they commented about how “different” or “complex” it was. I liked feeling smart! Haha… if those people only knew how easy it really was. 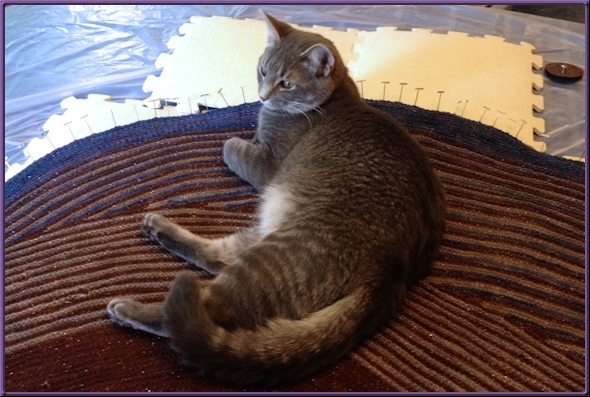 So as I was saying, yesterday I held knit group at my house so I could have help with the blocking. Tammy and Jessica helped with this and I am grateful to them! It was Jessica’s first time coming to our little group, and she just dove right in! I hope she comes back again so we don’t put her to work next time. Apparently Clyde thinks this luscious new shawl is for him! Of course we informed him otherwise. Apparently, I am a glutton for punishment. The new one is purple (of course!) with green and blue. I hope it is as much fun as the first one. 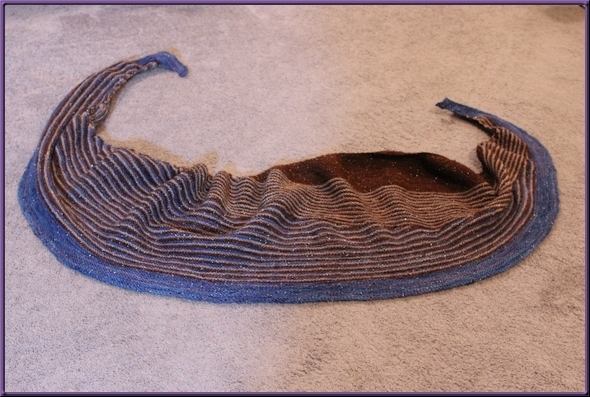 I’m hoping I’ll be able to get photos someday soon of a happy recipient in her new shawl. She doesn’t mind the camera, luckily, so watch this space for some fashionista photos very soon. Yes, I’ve Been Knitting, Too. 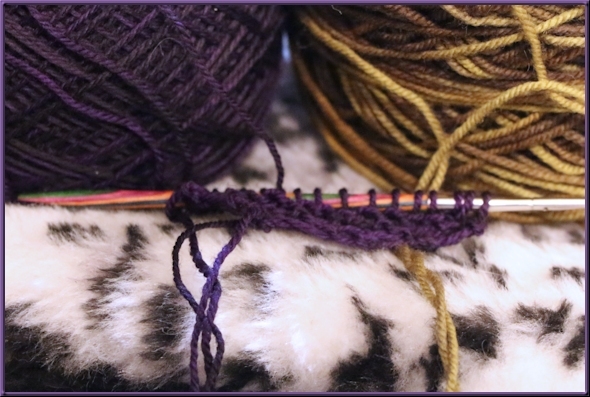 Ok, so this website did start out as a knitting blog, and I’m not intending to lose that concept. It’s been a while, but I have an update. 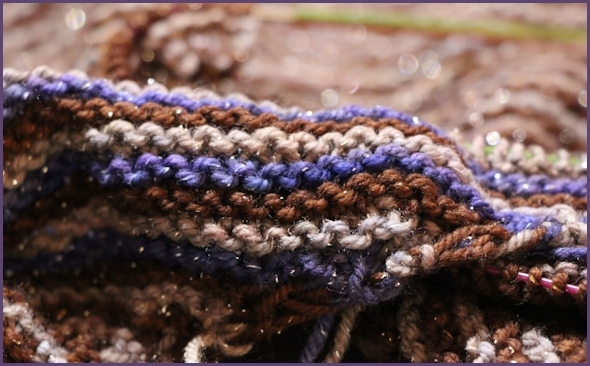 This one is made from Dream In Color Starry yarn in brown, grey and blue. This one’s a gift for someone who could use a little extra sparkle in her life, so you’re just going to get a sneak peek for now. Sorry! 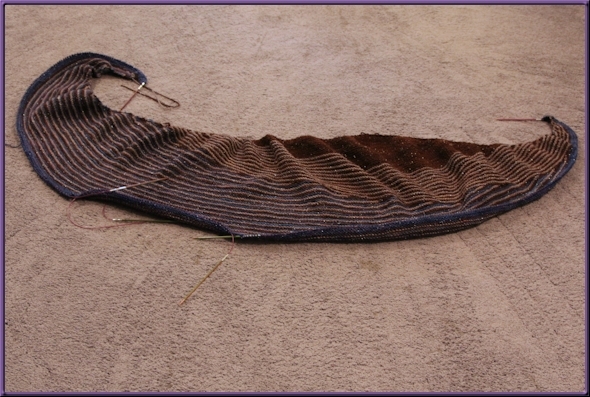 I’m loving knitting this project, and I’m looking forward to the next one, which will be for ME! That’s all for now… gotta get to work.